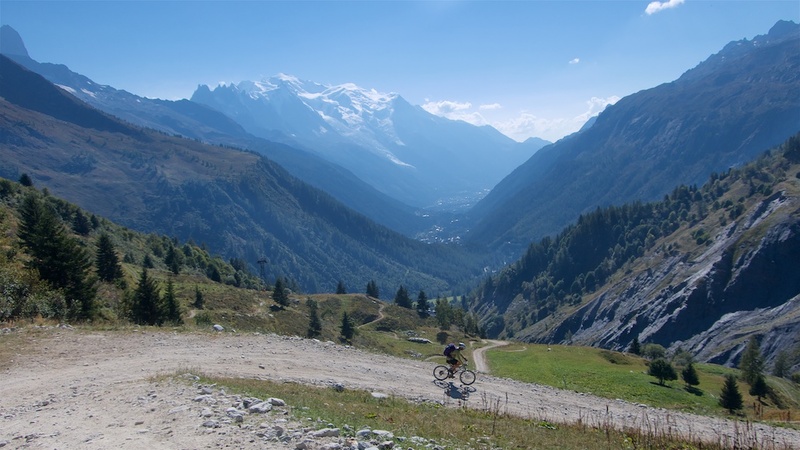 Day three of my Tour du Mont Blanc by Mountain Bike adventure with my pal Alfie was definitely the toughest. 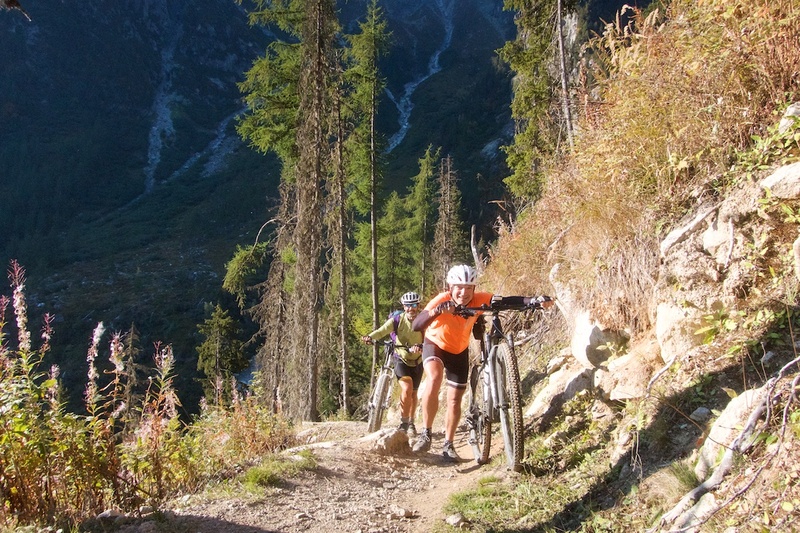 But like the two preceding days, this final stage was filled with unbelievable scenery and plenty of glacier views. 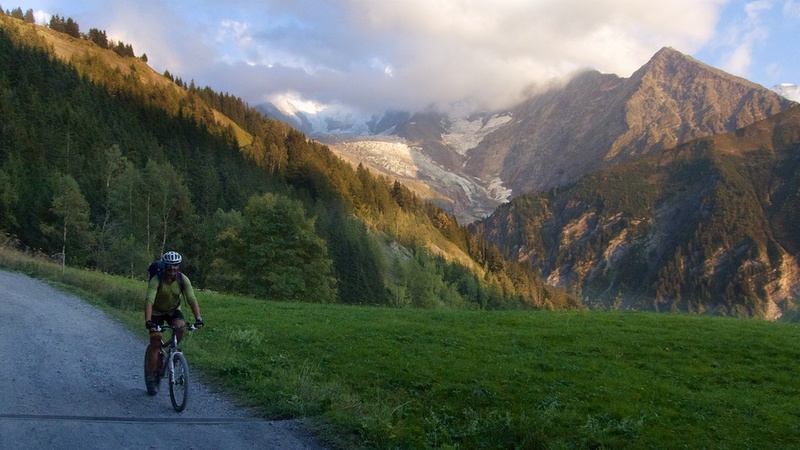 We started soon after sunrise and “closed-the-loop” on our Tour du Mont Blanc 30 minutes after sunset. Woohoo! Note, there is a second map at the very bottom of this article that details the entire three day loop. The night before, I’d been fooling around with camera settings trying to photo the moon and I stupidly left the ISO setting on 1600, so many of the photos on this final day are a touch sub-par. Bah! 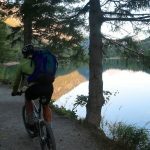 We started beside the beautiful Lac de Champex immediately jumping on trails to go around the lake. 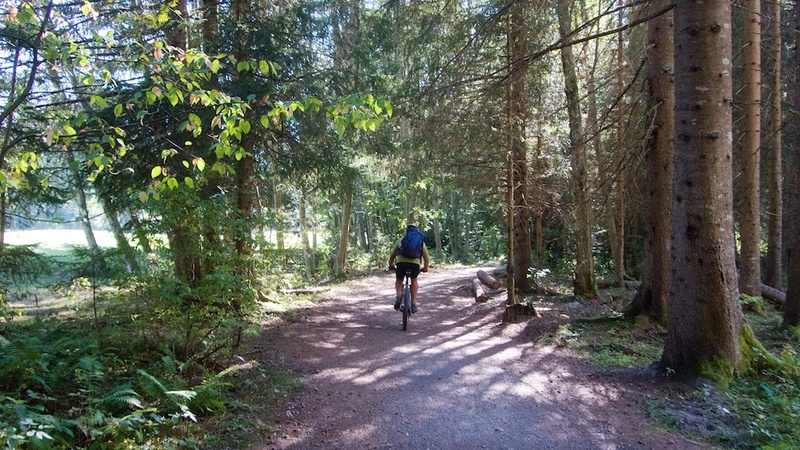 The first few kilometres were relatively easy down gravel roads and trails then began one of the toughest parts of the entire trip. 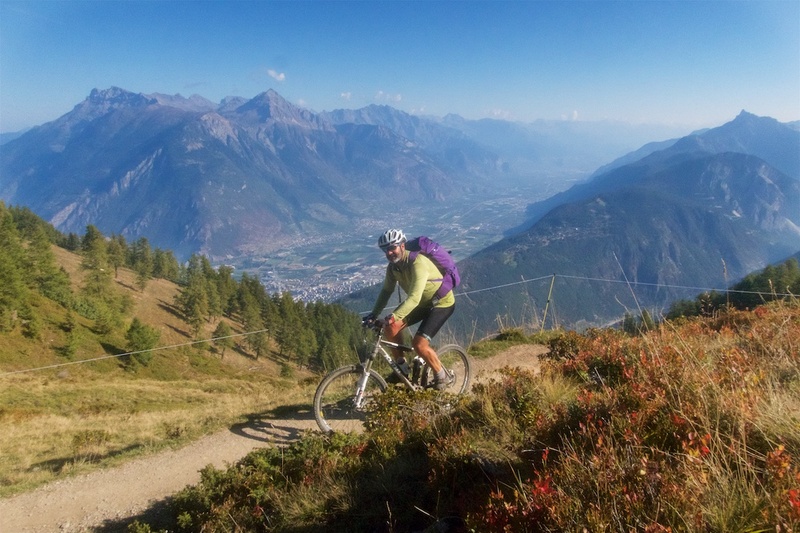 The last stretch up is rideable and gives towering views over the Swiss Valais floor around Martigny far below. 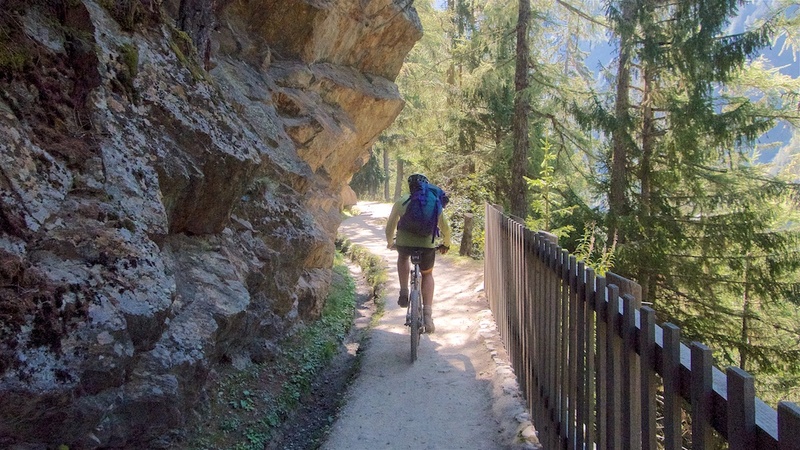 The descent to Col de la Forclaz is generally rideable single-track, but not easy. Alfie is a much better descender than I am, and he succesfully rode most of it. But he always needed to be ready to unclip and put foot to ground for a huge pile of tree roots, or rocks, or a narrow cliff stretch, etc. 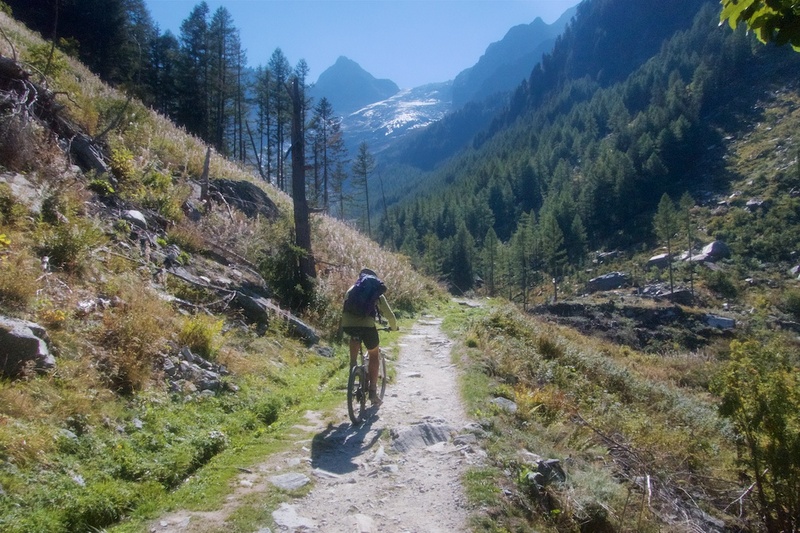 See here for details of the paved climb to Col de la Forclaz and beyond to Lac d’Emosson. 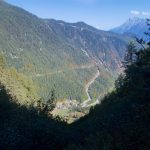 Instead of descending the main road from Forclaz, we took a truly fantastic unpaved ridge road into the Vallée du Trient. It’s initially fairly flat and heads directly towards the huge Glacier du Trient. 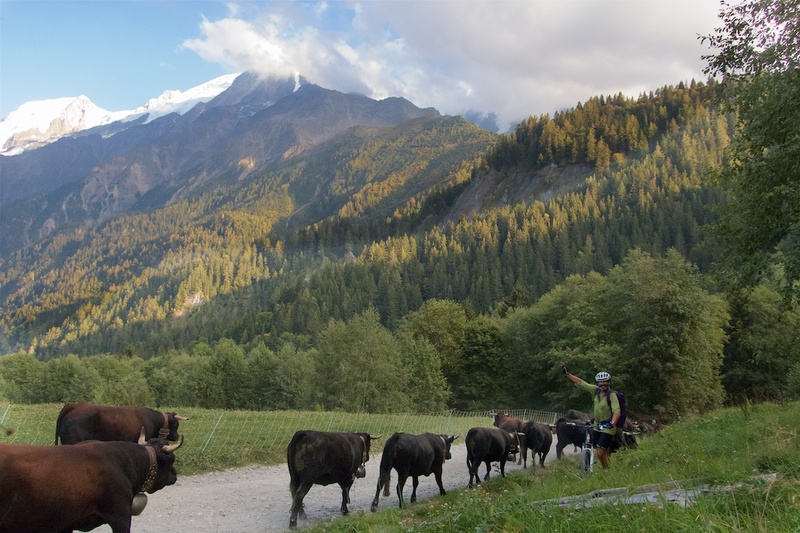 We would then descend a small paved road through the Vallée du Trient and very briefly join the main paved descent of Col de la Forclaz. With the village of Finhaut in sight we left the main road turning left to climb a superb little paved road towards Les Jeurs. 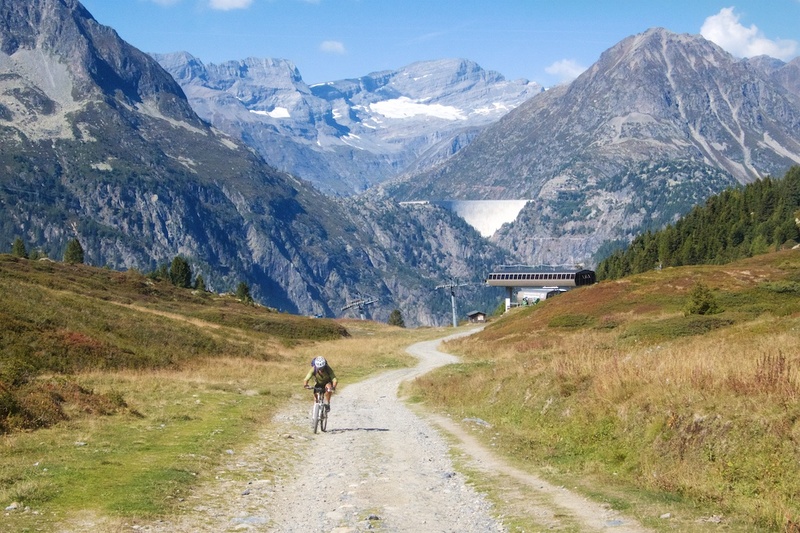 Hairpins galore and fantastic views of the paved climb to Lac d’Emosson in the mountains across the valley. 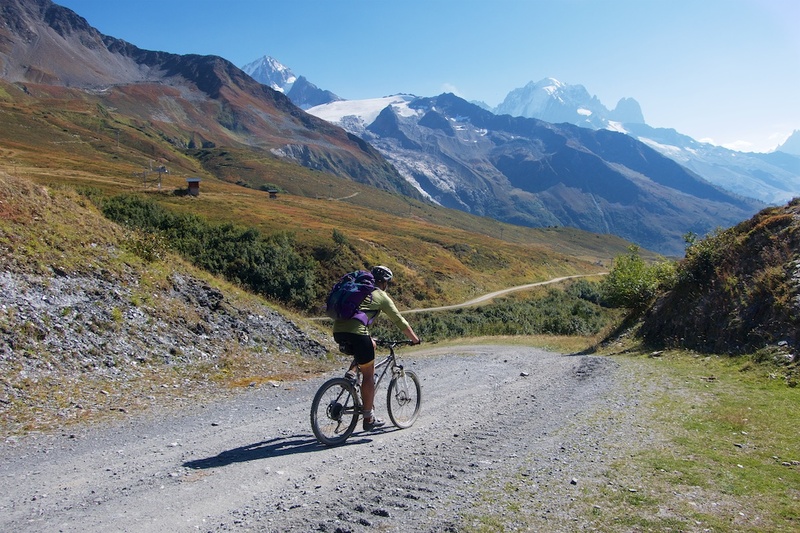 The balance of the climb to Col des Posettes is on a wide, good quality, ski-station service road. Steep at times but rideable. 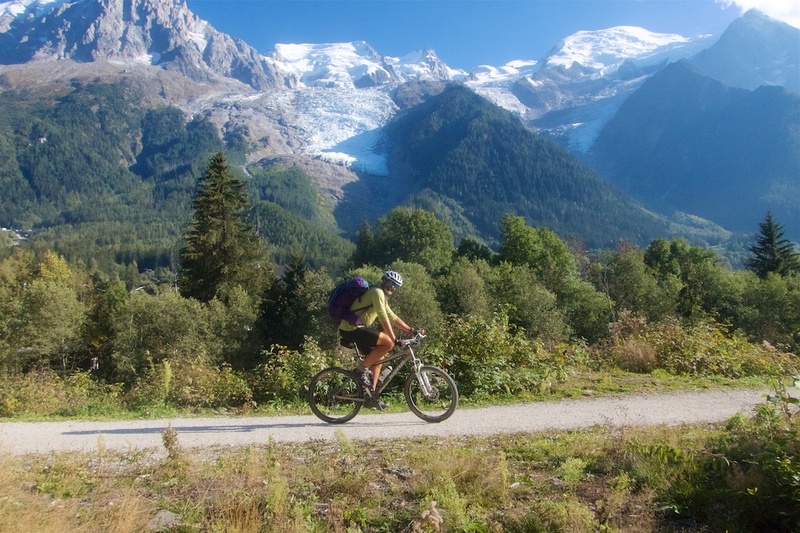 Approaching Posettes we began to see snow covered mountains and glaciers beside and part of the Mont Blanc Massif. 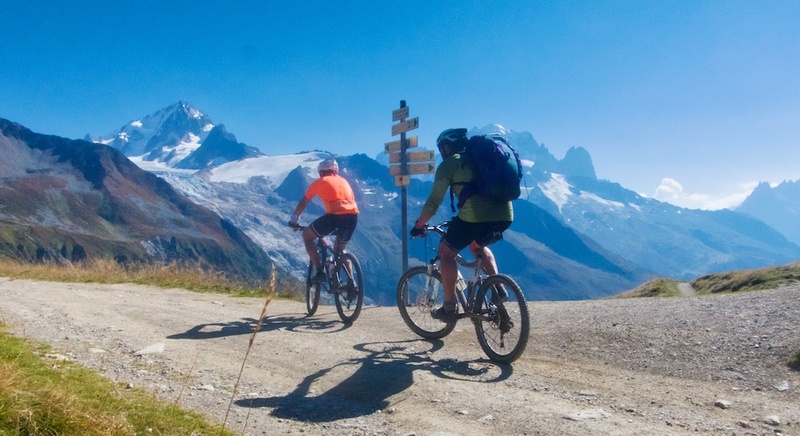 Above Col des Posettes is Col de Balme (2204m) exactly on the Swiss/French border. 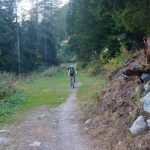 We didn’t have the time to visit but here are details of a fun loop from Chamonix that includes both cols. 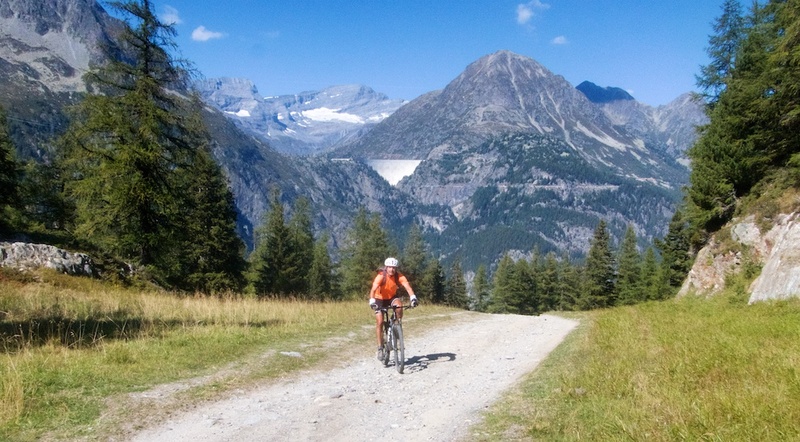 Nothing but beautiful views here as we descended on a ski station service road. The first couple of kilometres are easy riding, but, as the above map shows, it then becomes a hyper steep horribly surfaced gravel road. 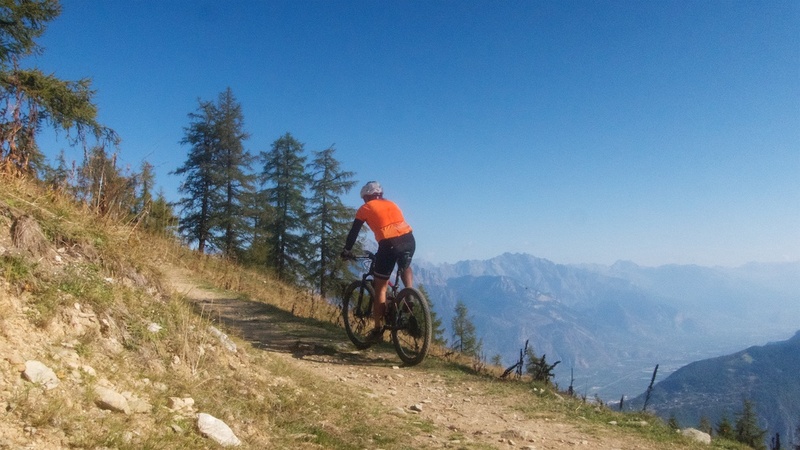 But there was a signed single-track course (in summer the chairlift takes up lazy downhillers) that Alfie had a blast descending. 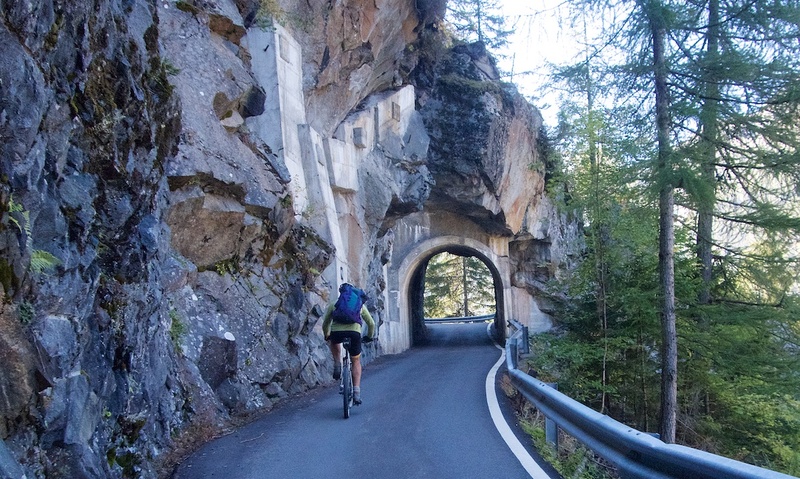 If you decide to do this loop, I highly recommend you follow our route for this segment. There are lots of options here, but we absolutely nailed it. 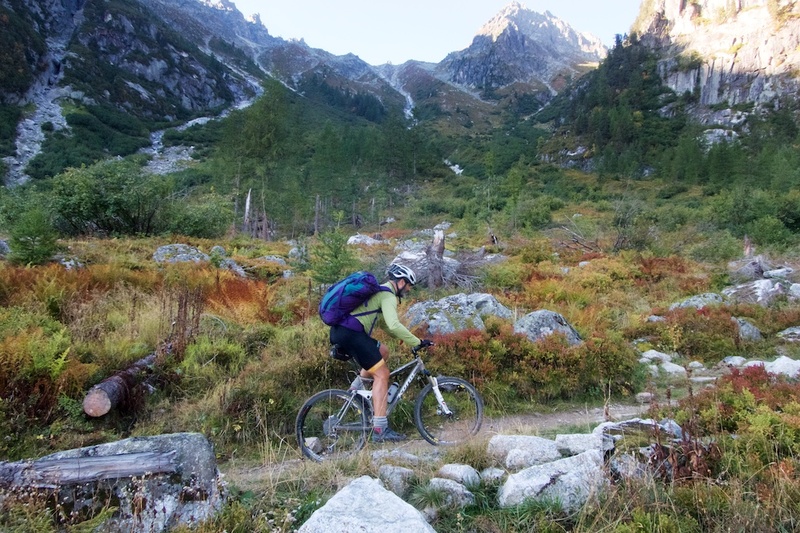 The vast majority of our route here consists of very rideable forest trails that almost completely bypass Chamonix and its busy surroundings. This was always going to be tough. It had been a long day and we knew we had to keep going to avoid descending in the dark. 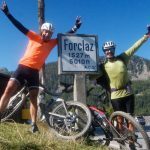 It didn’t help meeting an old man on the early slopes that told us we were crazy, that it was late, and too steep for bicycles. Merci, monsieur. It’s actually a nice, paved climb until roughly 1200 metres. 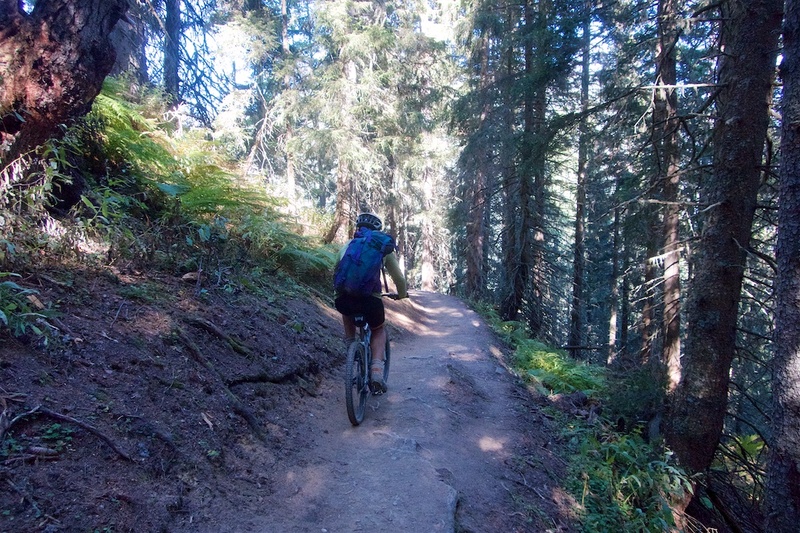 Here, at the base of a chair-lift, it becomes an extremely steep, but wide, gravel road. Much pushing. 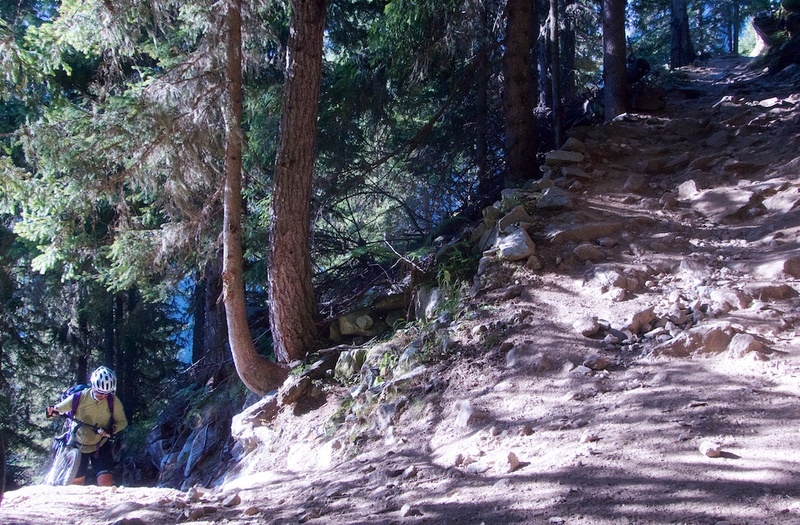 The base of the descent is roughly 5 kilometres below Les Contamines. Again, we had mapped some trails on the far side of the river, but it was now after sunset. So we decided to be boring but sensible. 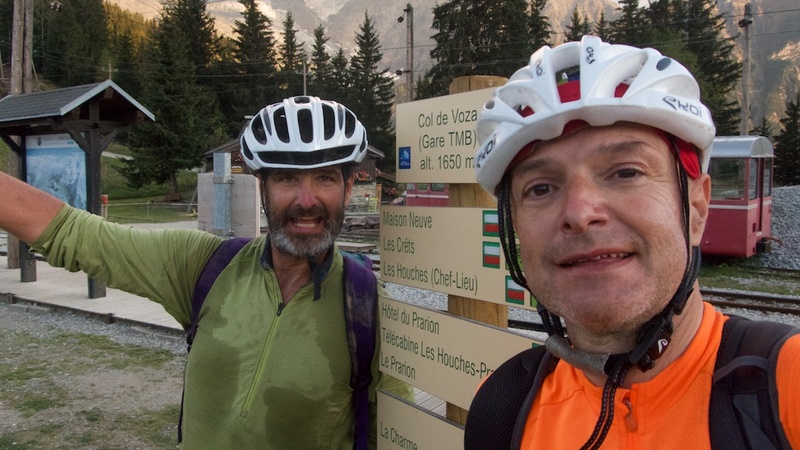 We put our bike lights on and rode the false flat main road back to the Day 1 start point. Over 12 hours on the bike, but we were very satisfied with our effort. This three day trip was fantastic. Alfie was the perfect companion. Cheerful and fully aware of the effort required. 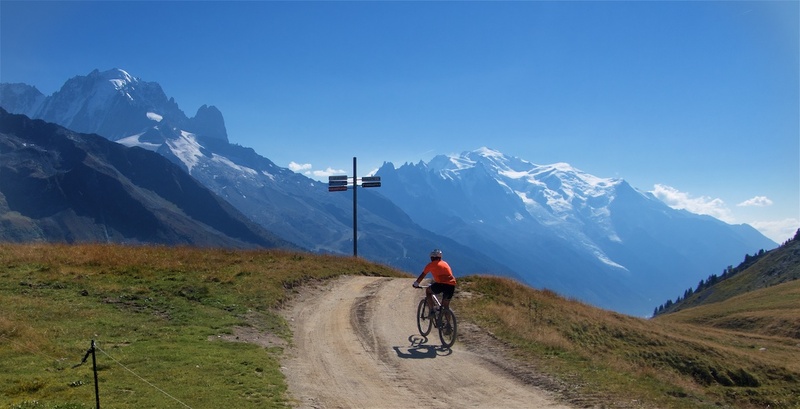 A final warning: This tour follows a famous hiking loop, the Tour du Mont Blanc (TMB). Anyone riding it needs to understand that there will be much pushing and bike carrying. But pushing in paradise can be fun. Well done guys. Impressive ride! Thanks for the detailed and entertaining report. 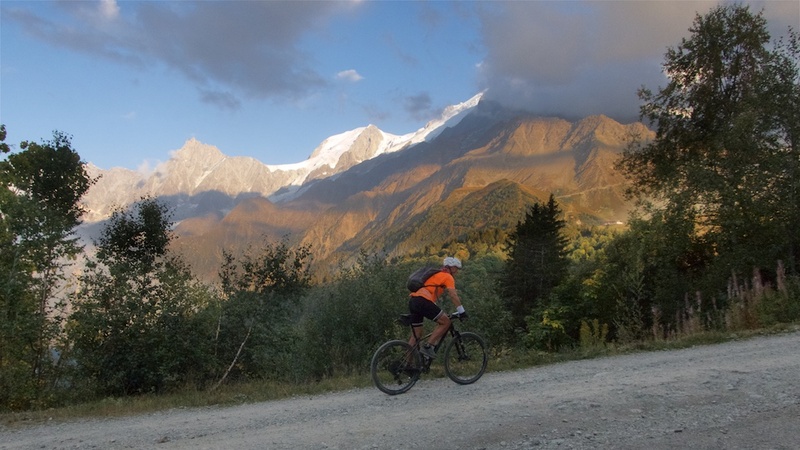 When I did something similar, instead of going over Col de la Croix du Bonhomme, I went via Lac de la Gittaz and Col de la Gittaz and then connected to Col du Joly using a hiking trail; I remember being able to ride most of that. I’d also wondered about the Porte de l’O option, but based on your description I think I won’t bother trying that. I looked closely at the Lac de la Gittaz option. 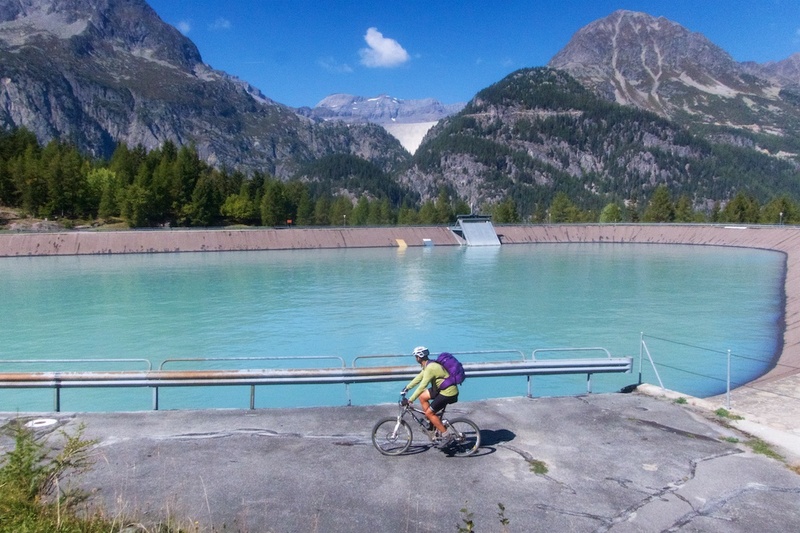 We could see the dam and the hairpins above the lake as we headed to Col de la Croix Croix du Bonhomme. Looks fun too. And Alfie carried your luggage? hehe, I quickly took of my backpack for photos …. 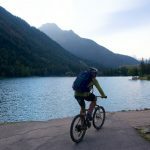 You never cease to amaze with your riding adventures and blog posts. Love it! !